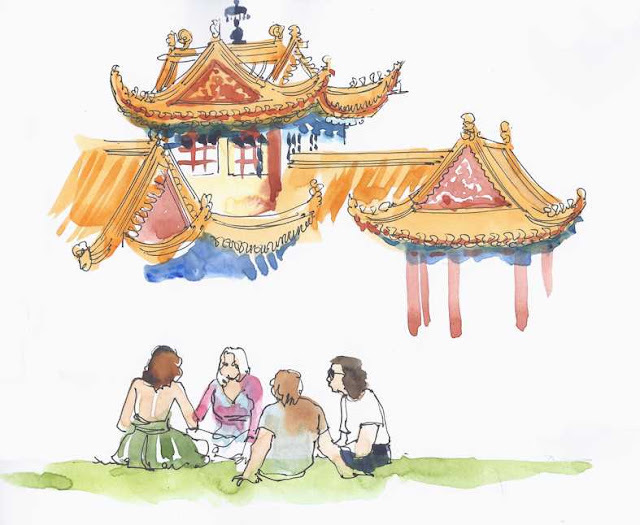 [by Cathy Gatland in Johannesburg, South Africa] After seeing the wonderful group post on the Chinese New Year World Wide Sketchcrawl, I was sorry we hadn't got our collection of sketches in on time. Joburg Sketchers drove about an hour and a half out to the Nan Hua Temple near Bronkhorstspruit, the day after the WW Sketchcrawl, where there were all day festivities. 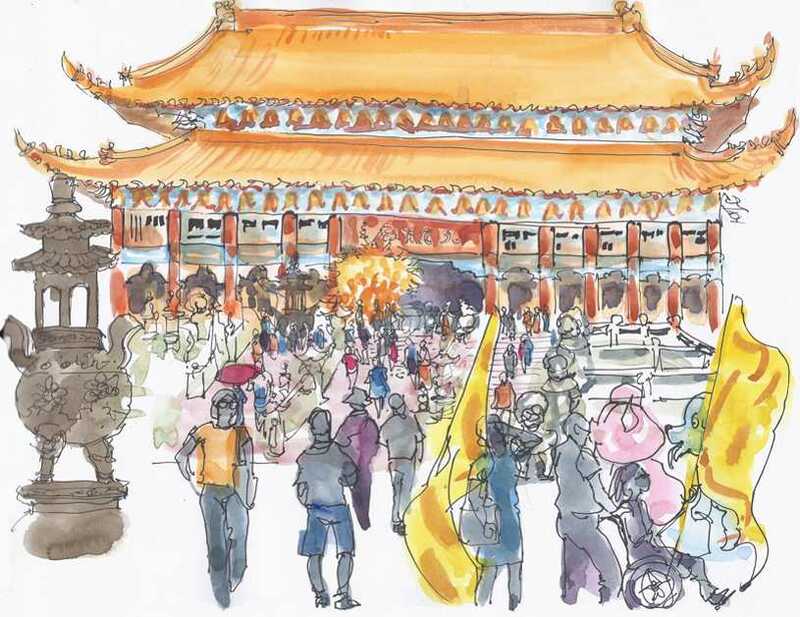 It is a huge complex with many temples and shrines, surrounding a large central courtyard with the main temple overlooking it. We arrived a little later than intended, behind a long queue of cars to get in. We made it through the gates just in time to see the dragon from the opening ceremony Dragon Dance being folded away into its trailer. I grabbed a pen and scribbled! 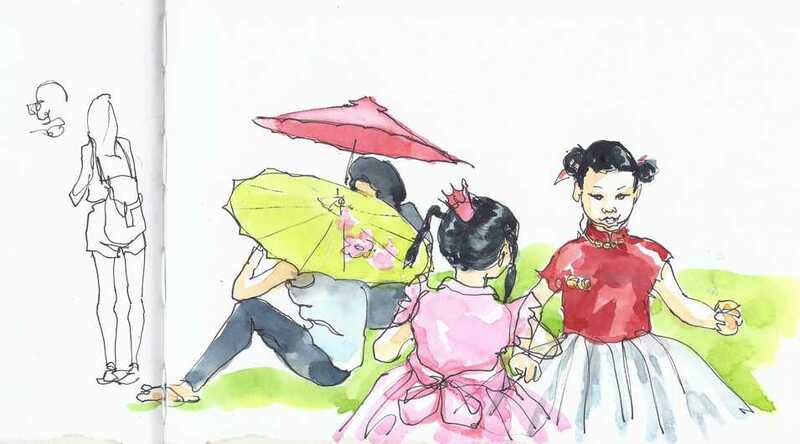 Two sweet little girls (and their equally well dressed brother who I couldn't catch) playing on the lawns in their New Year best, while others relaxed on a very hot day. Marlene sketched the big stone lions, with passing visitors in traditional dress - collaging a few of the thousands of spent firecracker papers on as a reminder of the day. 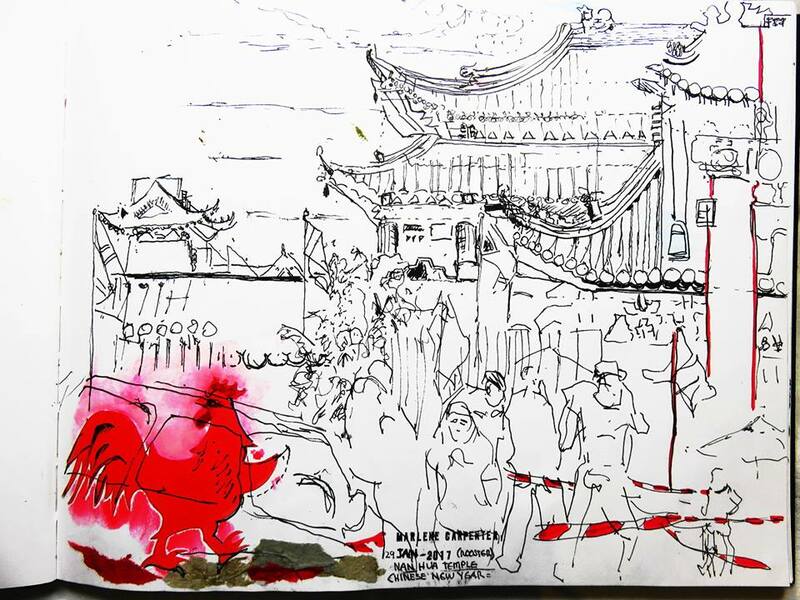 ...and continued the red of the Fire Rooster into the pattern of the ribbon separating the car park from the entrance. 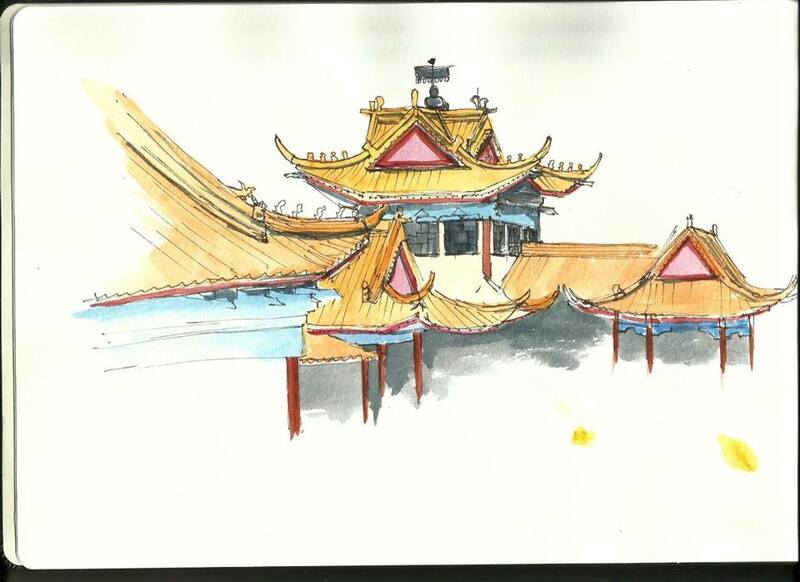 Anni worked on a concertina format and sketched in and out of the Temple where the Buddha statues preside. The attendants didn't mind us drawing inside, though no photographs were permitted. Lisa Martens looked up and concentrated on the beautiful roof shapes. We had a great attendance on the day, but only a few have posted their sketches - hoping to change all that over the course of our 10x10 USk workshops coming up!